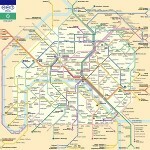 How to use public transport in Paris? 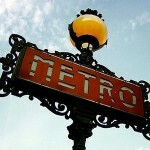 Subway (metro) and RER are quick and easy way to travel around Paris. 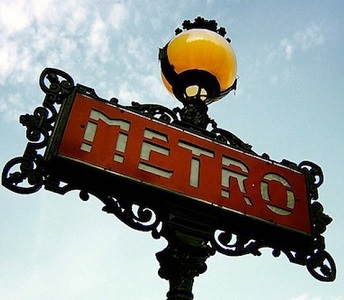 The city metro has around 300 stations and 5 RER’ lines. The bus by day of by night is a great way to discover the city. There are a lot of roads which go though the city centre, along the Seine River banks or through historical areas. 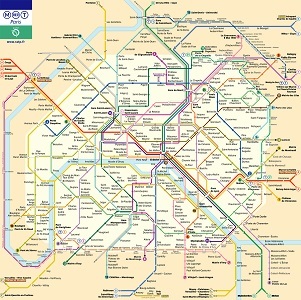 Go throught Paris (zone 1and 2) by subway or by bus costs the same price : single ticket €1,70 for one journey, including all connections. It’s cheaper to purchase a book of 10 tickets (“carnet”) for €13,30 at tickets machines in subway stations. Transports are free for kids under 4, half price for children between 4 and 11 years old. The Subway (metro) operates every day including public holidays from around 6 a.m. to 0.30 a.m. Times of the first and last trains depend on the stationalong the line where you are. Trains are less frequent on Sundays and public holidays. Illuminated signs above the platform indicate the length of time until the next train arrives. Fast and fully automated, the newest line 14, also known as Météor, offers a regular service throughout, Sundays and public holidays included. On this line, a verbal announcement indicates the name of each stop. Your white-coloured ticket remains valid for 2 hours until you leave the metro by going though the exit barriers. If you then take a bus, you need to use another ticket. If you happen to have kept some old green or yellow tickets from an earlier trip, you can still use them. 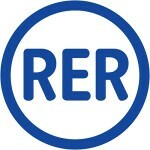 All RER lines are letters (A to E), all Metro lines are numbers (1 to 14). Each one has his own color. Each line has two directions, indicated by the terminus station at each end (the last station of the line). Every train and metro platform will mark which line you’re on and which direction the train is going, which is the terminus station. Use the ticket machines at your disposal in the stations. Choose your language to follow indications in english. You can also ask for information to a metro worker at the ticket offices in the stations. 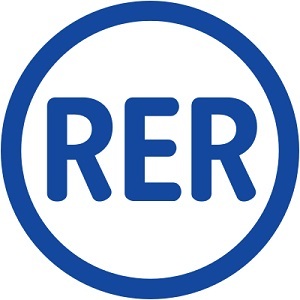 « Aller-Retour » means two single tickets. Tickets are valid and usable every day. Your white-coloured ticket remains valid for 2 hours until you leave the metro by going though the exit barriers. If you then take a bus, you need to use another ticket. You can pay by cash or €30 minimum for non-chip bank cards (like North American credit cards). Regular bank card with chip (CB, Visa, VPay, Visa Electron, Mastercard, Maestro) can be use from €1. Once past the turnstiles, follow the overhead signs and wall signs which indicate the terminus station (the last station on the line) of the line you are interested in. Each train and metro platform will mark which line you’re on and which direction the train is going, which is the terminus station. On a same platform, many trains can go to differents directions. Take only train which indicate the direction and the terminus station you are interested in. As long as the terminus station is not before the station you want, you can take the line since it’s going in the right direction. 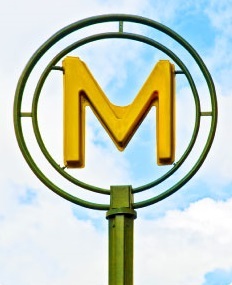 On the metro or RER platform you’ll see overhead signs along side the rails which show a lot of station names, each possibly lit with a yellow square before the name. If the name is marked with a yellow square, the next train that arrives will stop at that station. Look for the station that you want. If the name of the station that you want is not on the board, check the other side of the platform, which is going in the opposite direction. When train arrives, doors will not open automatically. Someone in the train, or you, must press the green or silver button on the door to open it. After arriving at the terminus station, look for blue « Sortie » signs which mark exits for the station. Paris’ bus offert 59 ways to go throught the City. It’s a great complements of the subway (metro). Buses operate from Monday to Saturday: 7 a.m. to 8.30 p.m. Some special bus lines operate in the evening from 8.30 p.m. until 0.30 a.m. Half of the buses run on Sundays and public holidays. 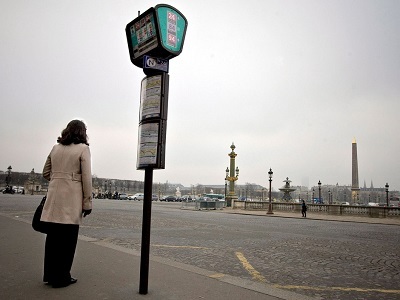 Paris’ bus plan is available in subways’ stations. 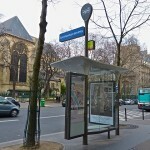 Bus stops can be either glass-covered shelters or simply poles. To find where catching public transport, follow these special signs. 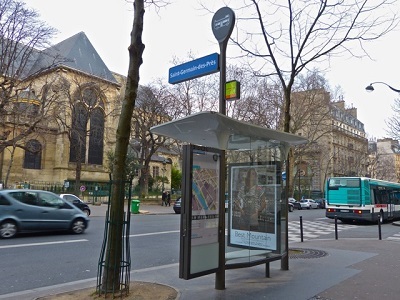 Bus shelters display the numbers of the buses that stop there and the itinerary of each. There are also details of the first and last departures, and the average waiting time between buses. In some bus shelters, electronic displays show the number of minutes before the next bus. The number and terminus are displayed on each bus. Raise your arm to indicate to the driver as he approaches that you wish him to stop. You must get on the bus at the front and get off by the middle or back doors. Punch your ticket in the machine as you get on or show your pass to the driver. Within each bus there is a network map and the detail of the route. When your stop is approaching, press one the red buttons inside the bus. 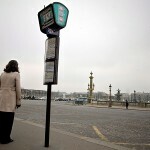 The sign “arrêt demandé” (stop requested) will light up at the front of the bus above the driver’s cabin. The Noctilien is a night bus wich runs from 0.30 a.m. to 5.30 a.m. See the Noctilien Map. Enjoy Paris by night inexpensively with the 42 lines of “Noctilien”. 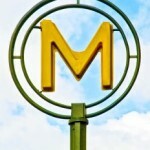 Metro or bus ticket can be used if you stay in Paris aera.